This table supposedly represents the percentage of the male civilian population that is currently employed based on the 2006-2010 American Community Survey data. As a demographer who works with social and economic data, the standard definition of the civilian population is the subset of the total population 16 and older not employed in the Armed Forces and not currently incarcerated. Typically, employment and unemployment percentages are calculated based on the civilian labor force, the subset of the civilian population that is either working or looking for work. This population excludes individuals who are not in the labor force because they are a homemaker, retired, disabled, or otherwise not actively looking for work. Based on this definition, my initial understand of this chart was that, if 7.2% of Polkton’s civilian male population were currently employed, 92.8% were unemployed. Knowing nothing about Polkton, I was immediately skeptical. Even if I knew Polkton was a severely economically-depressed community struggling in the aftermath of the Great Recession, this number would be implausibly high. So, I turned to the data. What’s Really Going on in these Communities? Figure 1 shows the employment status for the male population in these ten towns. The base population is all men ages 16 and older; they are broken into 4 categories: employed, unemployed, Armed Forces, and not in the labor force. The bars are ordered from the lowest employment rate (Polkton town, 7.2%) to the highest (Lillington town, 25.4%). A quick look at the data shows that the original table was not a representation of employment and unemployment. Rather, it was the proportion of men 16+ employed in the civilian sector relative to all men 16+, not only those in the civilian labor force. For example, Jacksonville is home to the U.S. Marine Corps Base Camp Lejeune as well as the Marine Corps Air Station New River. 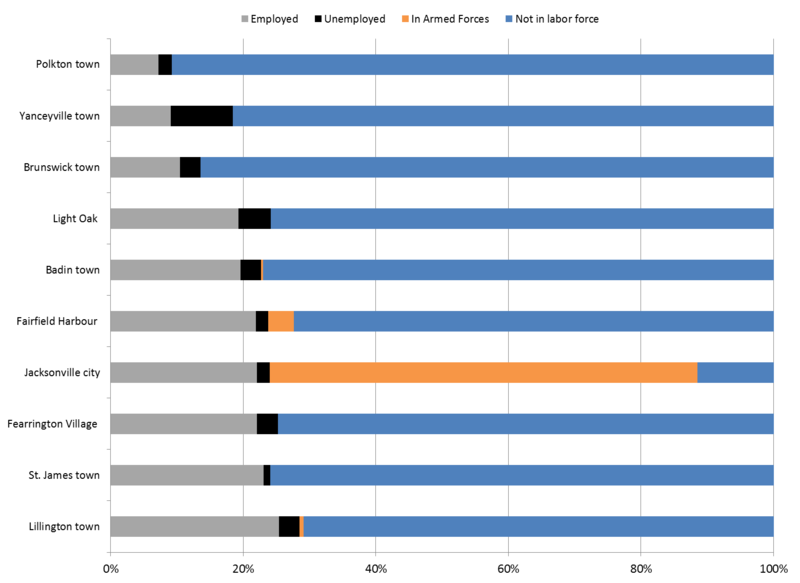 Nearly 65% of men in Jacksonville are employed in the Armed Forces. These individuals are not captured in the “civilian employed” population. These ten places are very different in terms of total population, age structure, and underlying economic conditions and opportunities, and there remain significant differences in employment patterns even after accounting for some of these differences. 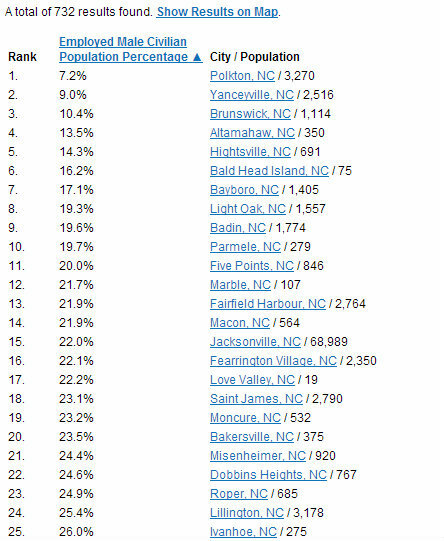 Figure 2 shows the unemployment and employment rates for males in these towns when you examine only the civilian population. None of these places is near the 75% or higher unemployment rate implied by the initial table I found online, but some still face significant economic challenges. Understanding and addressing these challenges, however, requires accurate data, put into context, not mislabeled and misleading charts and statistics. *The Cleveland Correctional Institute in Light Oak, NC, closed in 2009, but the prison population is still reflected in the 2006-2010 ACS due to the years covered by the data set. This entry was posted in Carolina Economic Data and tagged ACS, civilian population, employment, labor force, misleading data, unemployment rate. Bookmark the permalink.